Have a smaller boat and you don't want to have it in a slip? Keenan Marina offers In/Out Service for our smaller vessel customers. Simply, show up ask the Bull driver if you could have your boat put in the water and away you go! When you return we will ease your mind by putting your boat away and giving it a little scrub. Wash racks are also available for customers upon request. 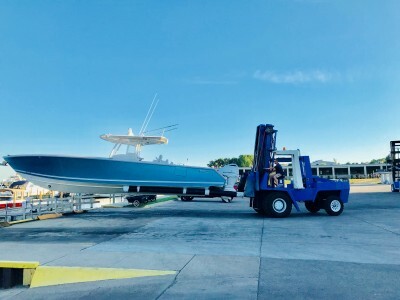 Note: Our Premium Tall Rack is an additional $500 fee for your convenience and those who elect to leave Bimini Up or who have a Wake Tower, Radar Arch, etc.